Expected the market to show strength in the month of April. While we saw some marginal new highs, it could hardly be called a strong market. As of Friday's close SnP500 was less than 1% lower since March 31. The NAZ showed more downside in April. This week should show some more weakness as we head into May. I doubt the market will be positive for the month of April and should start May on a weak note. 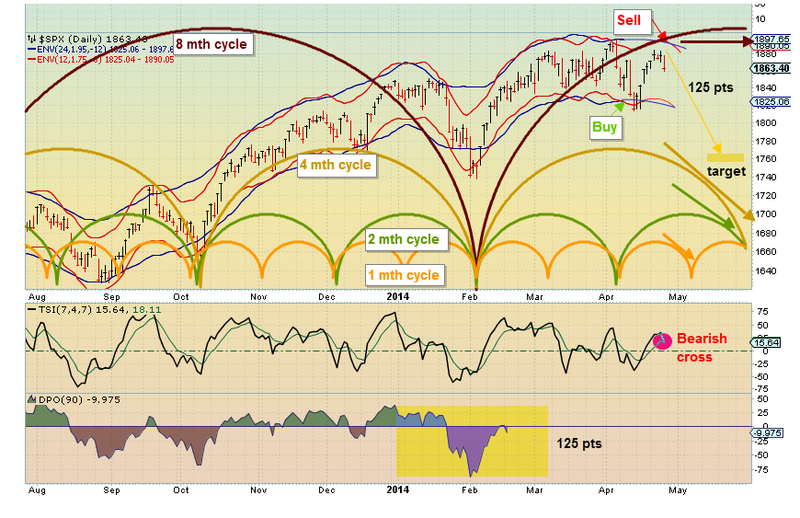 The 8 month cycle should top in May which could spell a sluggish summer for the Market. My best guess is May should be down, maybe a bit of a bounce in June and down in the Jul-Aug time frame. This market has the same feel to it as late 2007 and 2008. If true then I would expect a serious pullback to start by Oct of 2014 (and last over a year like 2008 into early 2009).